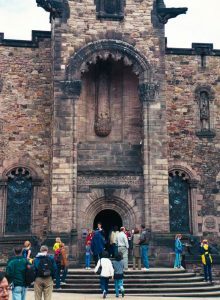 We woke to rain — good pouring, soaking stuff, but headed off to see Edinburgh castle anyway. I was nervous about parking just anywhere — the warning signs for illegal parking are posted everywhere. But we abandoned the car and started up the Main Street. Churches and museums line this road that leads up to the castle. A bit farther on is Rose Street, lined with pubs and tea houses, and past that is Prince’s Street, which is completely lined with shopping malls. We just hiked up the cobbled road and peered into the shops. There are a lot of tourist oriented shops here, but that’s to be expected. Even with the rain (which let up about the time we got out of the car) it’s crowded. Considering that we haven’t really found travel gifts for anyone – our trip to Braemar resulted in a ton of shortbread cookies for us, but not much else – we wander in and out of a few shops. 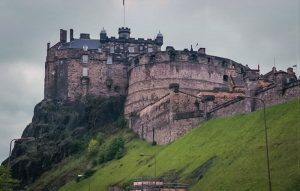 Edinburgh Castle stands at the top of the hill overlooking the city of Edinburgh, and it is damn impressive. There was a castle or fort here since the area has been settled, and the current castle spans many centuries of building. A lot of people are walking around with headphones on, staring at the guidebook. The office rents out an audio-guided tour of the castle grounds. We pass on the audio and start hiking up to the Great Hall. Cannons line the esplanade overlooking the city. In an old chapel building in the center of the castle is a war memorial, finished several years ago that houses the flags and pennants of every Scottish regiments in nearly every war they have been involved in. Huge leather bound books list the name of every man lost to the regiment. In the center is the tomb of the unknown. The Castle is crowded, so we decide to walk across the bridge to see Prince’s Street. Lunch first, though, in a crowded little pub right off the Castle Wynd. We sat inside at the window and watched the pouring rain on all the tourists. We even ordered dessert to avoid having to go out in the downpour. What sacrifices we make. We walked across the bridge to see Prince’s Street Not that either of us is much interested in shopping, but we figured that we should definitely at least see the place. The rain starts to fall in earnest, so we hide in a bookstore for a while, then head back looking for another B&B. Our flight leaves at 6 a.m., so we figure we ought to eat and then crash, planning to head to the airport and beg for an exit-row seat at 3 or so. The owners of the Murrayfield Park Guesthouse are very nice, even giving us a discount since we are going to bail in the middle of the night, and offered to leave us something to eat in the refrigerator for when we go. Once again, they don’t offer dinner at the house, but they own a little Italian Bistro just down the road. Off we go.